Studio demo 1 contains pre-production demos that were recorded at Air Studios, Monserrat between July and August 1986. Studio demo 2 is recorded at Air Studios, Monserrat in October 1986. Recorded after Bob Daisley�s arrival, since his lyrics are sung here by Ray Gillen. Studio demo 2 lacks guitar solos on almost all of the tracks except �Born To Lose�. This tape allows the opportunity to hear the bare rhythm tracks for the upcoming album. Studio demo 3 was recorded a bit later and does contain guitar solos for all tracks except �The Shining�. It is this version that provides the most complete sounding version of the Eternal Idol demos. November 1, 2010 Sanctuary/Universal UK released "The Eternal Idol - Deluxe Edition", which contains a bonus disc with some tracks from the Ray Gillen Sessions. Studio demo 4 songs are released only as the b-side for �The Shining� maxi-single in Europe (Warner Bros Records). The song "Some Kind Of Woman" was obviously left off the album because it is simply too different from the rest of the ETERNAL IDOL song list, sounding like something Van Halen might have recorded! The basic tracks for �Some Kind Of Woman� were recorded in Monserrat and contain the bass playing of Dave Spitz, making his first and only appearance on a Sabbath studio recording. Like �Black Moon�, it wasn�t an easy song to write lyrics for. So, it was left unfinished until Tony Martin was able come up with some words to finish it off. Iommi was a bit perplexed by the stuff that Martin came up with, but still decided to go with it in the end. The demo for �Black Moon� demo was recorded during the final ETERNAL IDOL recording sessions in London, probably in August �87. Originally titled �Gypsy Warning� when the band began jamming on this song earlier on in the sessions, it remained an instrumental until Martin laid down his vocals on this rendition. Geoff Nicholls made his one and only appearance playing bass on a Sabbath studio album with this track. He also played the keyboards here as well. Both Tony Martin and Geoff Nicholls have claimed credit for writing lyrics on this one. 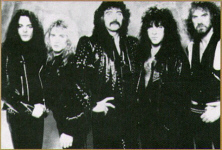 Black Sabbath re-recorded "Black Moon" for the 1989 "Headless Cross" album. Studio demo 5 is a Japanese bootleg CD release by Zodiac entitled "The Eternal Idol Working Tracks" (numbered CD, ZODIAC 073 - Japan 2014). High quality demo tracks from the Eternal Idol recording sessions. The tracks are significantly different than all existing demos from Ray Gillen's time with the band. November 1, 2010 Sanctuary/Universal UK released "The Eternal Idol - Deluxe Edition", The additional tracks include 'Some Kind Of Woman' and 'Black Moon' (demo) on Disc 1.